New initiative will recruit thousands of IDF medical personnel to expand MDA's Life Guardians, first responder teams throughout Israel. The IDF Chief Medical Officer, Brigadier General, Dr. Dudu Dagan (who recently ended his term) and MDA Director General, Eli Bin, have announced a first of a kind collaboration between MDA and the IDF Medical Corps. 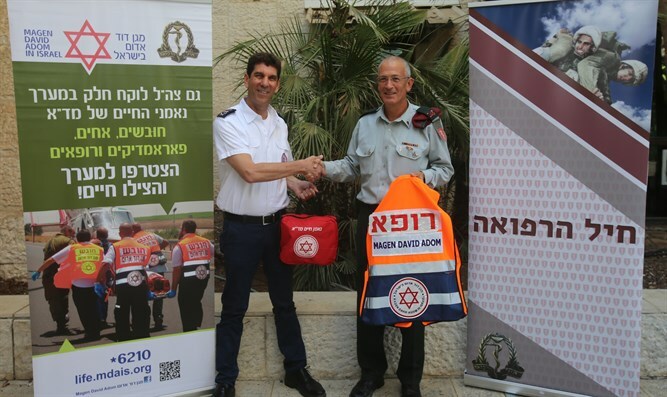 As part of the collaboration, all medical personnel within the IDF will be invited to join MDA’s “Life Guardians” project which enhances the survival rate of civilians experiencing cardiac arrest. According to statistics, only 3% of those who experience cardiac arrest outside of a hospital survive and recover without suffering permanent damage. One of the factors that enhance survival rates in case of cardiac arrest is conducting chest compressions during the initial moments following the loss of consciousness and until the arrival of MDA teams to the scene. The idea behind this large, innovative initiative - that received the name “Life Guardians” - is that every civilian who has gone through a basic, 20-hour first aid training, is able to conduct basic resuscitation to patients suffering cardiac arrest, and provide lifesaving treatment in the critical minutes prior to the arrival of emergency medical teams. The initiative, which has already been joined by tens of thousands of civilians with basic first aid training, will also be joined by the IDF’s thousands of medical personnel. In the IDF, there are thousands of medically trained soldiers, officers and reservists, among whom are EMTs, paramedics, nurses and doctors well trained in first aid and conducting resuscitations in emergencies. Through the IDF Medical Corps, they will be able to join MDA’s Life Guardians initiative and regularly receive emergency calls using a mobile application that locates all medical personnel found within a five minute radius from the scene as reported to MDA’s 101 dispatch center. As part of the collaboration, MDA staff will arrive at the IDF Medical Corps’ training base to brief the soldiers on the initiative. Those who find it interesting will able to voluntarily join the project and become a Life Guardian in their spare time. Former IDF Chief Medical Officer, Brigadier General Dr. Dudu Dagan acts as an example to his soldiers and serves as a Life Guardian himself. MDA Director General, Eli Bin thanked Dagan for his help in getting the project off the ground.